With more than 53,000 alumni representing 159 nationalities and working in 170 countries, the INSEAD alumni network is incredibly diverse, engaged and powerful. This robust alumni community is critical to the school’s continued success. With this in mind, INSEAD and the INSEAD Alumni Association (IAA) recently created the INSEAD Alumni Vision 2020, a partnership agreement focused on improving and enhancing alumni engagement. The IAA is the umbrella organisation for the National Alumni Associations (NAA), National Alumni Clubs (NAC), National Contacts and Global Clubs. The new agreement renews the IAA’s commitment to collaborate with INSEAD to support the alumni community and school. It also rearticulates the vision for how the IAA and INSEAD will cooperate in the years ahead, explains INSEAD Director of Alumni Relations Austin Tomlinson. The renewed partnership states the IAA’s and INSEAD’s shared vision to ensure that INSEAD remains the world’s best business school through a network of fully engaged alumni. It also outlines their mission to work together to maximise IAA/NAA Alumni membership and increase opportunities for alumni to connect with each other and the school. Founded by alumni as an independent organisation in 1961, the IAA’s mission is to serve and engage the global INSEAD alumni community and to foster lifelong relationships among alumni and with the school. The IAA’s unique model of alumni relations is based on volunteerism and is autonomous in its legal structure. Jean Marie d’Arjuzon MBA ’60, the IAA’s first president, established a clear vision and model for the organisation. The unique nature of this model has helped instill a strong sense of community and ownership among INSEAD alumni. When current IAA President Sadia Khan MBA’95D came into her leadership role three years ago, her mantra for the organisation was “collaboration.” Her goal is to lead the IAA in working with INSEAD to build a bright future together for the school and the community. One of her first actions as president was to begin the process of creating the INSEAD Alumni Vision 2020. IAA Executive Committee Member David Mair MBA’96J headed up the initiative to outline the partnership and strengthen INSEAD’s incredible volunteer network. 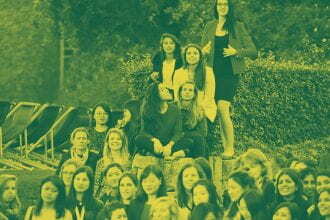 Unlike many peer schools, where the alumni relations model is top-down, INSEAD’s alumni network is more of a grassroots movement from the bottom-up, explains Austin. The IAA is serviced and supported by 55 national associations and clubs around the world, whose activities are funded through membership dues. Members’ affection for INSEAD often fuels their commitment to the associations. INSEAD Alumni Vision 2020 outlines the benefits active alumni receive from being part of the alumni network and joining their national association. The IAA and INSEAD have recently released a video summarising these benefits. What is particularly noteworthy is that for the first time, the agreement also sets out the commitment of both the IAA and the school to continue to enhance the membership experience. Membership enables graduates to network with alumni in their local country and in associations all over the world. Members also receive access to additional resources, such as webinars and online INSEAD courses; information on the best business journalism and academic research; and exclusive invitations to members-only, high-calibre events. Editor’s note: If you’re not yet a member of your NAA, join today. To get started, visit my.insead.edu or learn more about alumni services at insead.edu/alumni. Adding on to these initiatives, it would be great if the program of Alumni reunions taking place every 5 years was renewed. Next year my promotion will be invited for the eightst time and if not changed the agenda will be more or less the same for the eightst time. This is not a great incentive to come and donate. Thanks for the comments, definitely something to be considered. We’ve passed this on to the relevant people.